Sega has taken a full page advert out in the newest issue of License! Global. The advert mainly thanks various partners for their support over the last 25 years. 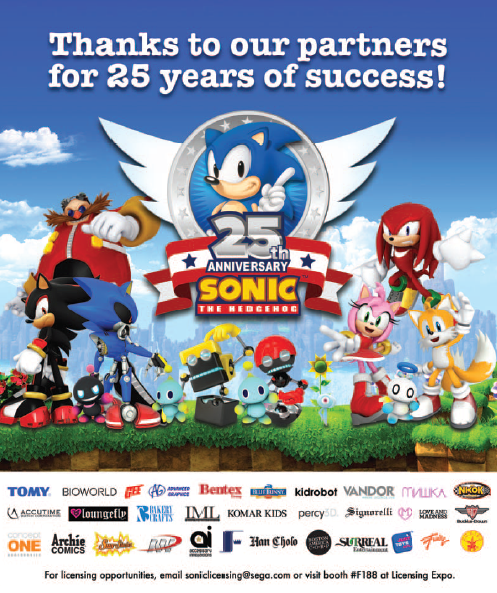 The advert also lists a number of companies who have recently confirmed that they are making products for Sonic’s 25th Anniversary and 2016-2017 period. Now, what’s interesting is that this list doesn’t include some of the bigger names who have provided tons of Sonic products over the last 25 years, including Jazwares who used to be the master toy partner, nor does it include F4F or Insert Coin, they all appear to be new companies or companies who have recently announced new products for the year period 2016-2017. There is however one interesting exception. NKOK is on the list, who are they? Well, this is where I start to stroke my beard. They are the company who have in the past made remote control cars or racing themed toys… which were licensed on games which also included vehicles. Sonic Riders, Free Riders and even the All Stars Racing series. The list also includes Kidrobot who make those strange deformed figures, this is a new partner which was previously unknown. Typically they release several different figures from a collection, meaning we might see an entire range of figures, not just Sonic, Tails & Knuckles. There are also a number of other logos I can’t identify, this is the list I can come up with, if anyone is able to fill in the gaps or confirm any I’m unsure of, let me know in the comments. So from left to right, here are the companies. This barren desert of Sonic news these path few months are turning us into homicide detectives. We can solve any case now. Lol, too true. I don’t know how to react to this. The Sonic community is on the case…? I just don’t like the hype that comes with any little thing. Neat! But… Save for the chao, awfully generic. Do they ever make new renders of characters for anything? At least new poses or something? I’m not sure I’ve seen that render of Shadow before. It might be new. It’s not new. I’ve seen it before. I’m hoping for new renders in the upcoming game. … That is, if they use all the characters I want renders for. I’ve definitely seen the same renders for the other characters, though I can’t say the same for Shadow. Ive waiting years ago of Sonic 3 Android release??? Geez SEGA, you couldn’t even spend cash on new art for your thank you Advert? SegaSonic Ice Cream Shop confirmed? That GEE is indeed Great Eastern Entertainment. Bottom right is Just Funky, then Rubie’s. Metal Sonic being on the image makes me happy – they’ve finally made an image of just the core cast (Sonic, Tails, Knuckles, Amy, Eggman, Metal Sonic) + Shadow because he is the anti-hero of the series. i think they spend there IPs on making products for the 25th anniversary and not much to think about other companies are aware about SEGA licenses on there products for making them fully license by other companies. Yay! The 25th anniversary is tomorrow. I still feel that Blaze doesn’t get enough love. I love the new companies worked on Sonic merchandise toys & everything for Sonic 25th Anniversary! 25 years of success? Sonic Boom was a success? Lost World, 06, Shadow the hedgehog was a success? I’m so lost… either i’m missing something or Sega is honestly retarded. I hope they do a GE Animation Julie-Su, Nicole, Bunnie Rabbot and a Sally Acorn plush.